Three hours and 31 brewers -- Erie, enjoy your craft beer on the bay. "No other industry is like the craft beer industry," says Jason Lavery, as we sit, sipping some La Bealtaine near a loading dock in the back of his brewery on West 12th Street. "Customers are paying to come talk to you, and at our company, we have enough respect for those people that we physically attend the festivals we go to." La Bealtaine is a White Fire Wheat Ale that the Lavery Brewing Company is featuring as a summer seasonal. Hoppy but not aggressive, it's a smooth, inspiriting beer cool enough to slake a thick summer thirst, yet light and crisp enough to take the edge off of a muggy Friday afternoon. Along with this summer ale, Lavery and crew will bring their Liopard Oir, a farmhouse saison, which they've purposely soured to give it a tart, refreshing, historically-accurate appeal, to join 30 other brewers at the 5th Annual Beer on the Bay Saturday, July 28. Organized by the Erie Regional Chamber and Growth Partnership and Erie Brewing Company, Beer on the Bay offers Erieites and out-of-towners alike the chance to sample craft beer from 31 brewers whilst drinking in the beautiful view of Erie's bay from the Burger King Amphitheater at Liberty Park. Claudia Thornburg, vice president of the chamber division, credits Erie Brewing Company, who pioneered the event five years ago, for the swelling success of Erie's premier summer beer event as well as making the decision to host the event on Erie's waterfront. "Kudos to Becky Niemeyer at Erie Brewing because she's the one that picked the venue," Thornburg says, as we sit on the stage at the amphitheater, gazing up the hill. "There're a lot of brew festivals, but they're not on the bay with the breeze and a beautiful grassy knoll under a great amphitheater, and that's what people talk about – there's not another venue like this. It's summertime – who wants to be inside during the summertime?" Erie Brewing charted the waters for the first two years, and the Chamber came on board during the third year. Ever since then, it's been a partnership of beer and business. "Erie Brewing has a really great rapport and relationship with local brewers and local distributors in the tri-state region," Thornburg says. "We're looking to build exposure and attendance. It's a destination kind of event; in the summertime, we have tourists here already that can take part in the event, but a lot of folks travel here from outside the Erie area." Later in an email, Thornburg explains that, "a majority of the ever-growing craft-beer enthusiast population is represented by the educated young professionals that Erie looks to attract and retain." Simply put, that translates to a positive social and economic impact for the Gem City. People travel to Erie, shell out cash during the event, maybe grab dinner afterward, decide to stroll through the city to find entertainment, and then bunk down in an Erie hotel for the night – because Beer on the Bay brought them to the city. Additionally, Beer on the Bay helps foster recognition for the brewers attending, like Lavery Brewing Company. "We're here," he laughs, after pausing, before adding that they now ship beer as far as Philadelphia. For him, Beer on the Bay helps create greater awareness for his young brewery as well as greater awareness for the craft beer movement in general, which Lavery says is good for the whole industry. Last year the event featured all of the brewers under one tent, and Lavery sums up the experience in one word: "hot." Aside from a large community tent with shade and chairs in the middle for attendees, this year, Thornburg explains, brewers will ring the crest of the hill in 20-feet-by-20-feet tents with two brewers to a tent, allowing for more room to work and talk to enthusiasts. "I'm a talker," Lavery says. "I can talk to people all day long, so I like talking to each person who visits our table. I try to engage people at festivals if they're willing to talk, so that I can chat with them one-on-one to get a sense of what beer they like, whether it's their first festival or not, are they a homebrewer, what's their favorite beer..." He trails off, smiling. "I like that. That one-on-one connection – that's what craft beer's all about." In addition to the 31 brewers as well as a tent housing various homebrewers, vendors will be onsite featuring everything from pulled-pork sandwiches to hand-rolled cigars. And for just a little more coin, patrons can upgrade to VIP status, which grants access to catering from Firebirds Grill, Giant Eagle, and Smith Provision, as well as other brewers. During the first session, Colonel Mustard will provide live entertainment; Small Town Rollers will take over for the second session. Regardless of which session you may find yourself tipping a few back, both Lavery and Lynch offered advice to both craft beer veterans and newcomers alike. "Don't try to drink them all," Lavery says first, laughing. "Don't be afraid to dump something you don't like. It's quality, not quantity." But do so politely at the next station, he adds, since brewers will rinse your glass out before filling it with their brew. "This is about trying beer, so sample lightly," Lynch cautions. "Sometimes even 4 ounces is too much." The commemorative tasting glass included in the ticket price is 4 ounces, but as Lynch notes, if you're unfamiliar with a brewer or particular type of beer, you can simply ask for half of a glass and brewers will happily oblige. "Talk to brewers," says Lavery. "That's one of the things that I love," Lynch piggybacks. "When you go to a brewpub, you don't always get a chance to talk to the brewer; whereas at an event like this, you actually get to talk to them, especially the local guys." "We're looking forward to it – it's our hometown, so we're always proud to be from Erie and proud to be here," Lavery concludes. "Some people in Philly are like, 'Erie, that's not in Pennsylvania!' so we're trying to change those people's perception; there are a lot of good breweries in town and a lot of good people here." But with only three hours and 31 brewers and multiple vendors, be sure to use your complimentary tasting booklet and choose wisely, as you'll face the problem of being overwhelmed by choice and option. In this case, that's a problem you'll be happy to have. And just so you know, that's Lav-ry, not Lave-ry for when you stop by the tent to talk to the Jasons and Nicole to have some beer then and not save it for later. Sessions will be held from noon to 3 p.m. and 4 to 7 p.m. Presale tickets cost $30 (VIP tickets add $15). Designated-driver tickets are $10, and the Care Cab will be available from Erie Transportation Services. Add an additional $5 for tickets purchased at the door. 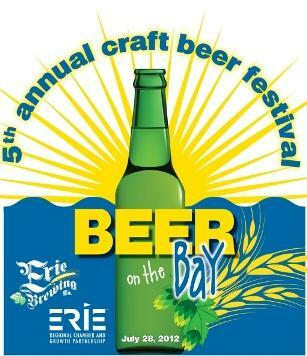 For more information, call 454.7191x123 or visit EriePa.com/Beer-On-The-Bay. Ben Speggen will be found at the Erie Reader tent at Beer on the Bay enjoying more of Lavery's Bealtaine and can be contacted at bspeggen@eriereader.com prior to, during, and after the event.